ICOVO,the world’s first and only ICO platform that can actualize healthy ICOs is holding the very first event in Singapore on July 17th. 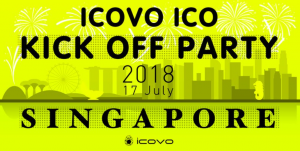 ICOVO, the world’s first and only ICO platform that can actualize healthy ICOs which is based on the concept of DAICO, is holding the very first event in Singapore on July 17th. The theme is not limited to ICOVO project details and ICO’s future based on each country’s ICO regulation. We are also having Blue Belt COO Mr. Jack Tran as a special guest to discuss about ‘’The future of ICO and Exchange’’. Blue Belt has gained momentum by expanding service in Korea, Vietnam, the Philippines(preparing for the license), Indonesia, Australia(preparing for the license), Estonia(licensed), Malaysia, Myanmar and Bangladesh through subsidiaries in each countries. Currently, they are applying cryptocurrency exchange license in Japan through one of the subsidiaries taking Japanese market into consideration. Admission free. First-come-first-served basis.